Disclosure: Some of the links in this Double Peanut Butter Spider Cookie Recipe post are affiliate links, and I will receive a small commission if you click on one of those links and make a purchase but it comes at no expense to you. It is year one of preschool, and we have already commenced with the borage of after-school activities, field trips, and parent-sponsored party favors. I'd like to complain about the added responsibilities, but the truth is I kind of love it. I love hearing about my kid's school day when they clamor into my car after the final bell rings. I love organizing their school papers and making sure their schedules are carefully noted on the family calendar each month. I love waking up before my little ones to meticulously pack their lunch each morning. I honestly love it all, and I'm trying to fully embrace this stage of their life. I love supporting my kids and watching their imaginations and personalities bloom right in front of my awestruck eyes. They are each growing so fast and every morning dawns with a new discovery; one of them might learn to say a new word, and the other one is suddenly spelling it. All the while, I'm sitting in the background watching these beautiful little blessings become acquainted with the world and find their place among it. I'm grateful for the opportunities when I get a glimpse into their school life, since it is the part of their day in which I normally do not get to participate. This upcoming week my little guys have a costume parade, and the teachers reached out to the parents for cookies for a banquet after the ceremony of superheroes and princesses. Of course, I'm on board! 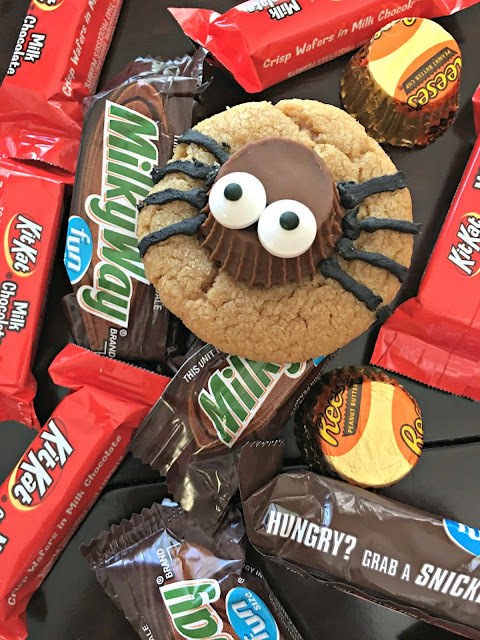 I put together these fun Double Peanut Butter Spider Cookies, and they were a huge hit with the kiddos. In a large bowl cream the peanut butter and sugar. Add the vanilla and egg and incorporate thoroughly. Roll the mixture into 1-1/4 inch balls and place on an ungreased baking sheet about 2 inches apart from each other. Bake for 12 minutes or until the tops of the cookies are slightly cracked. Immediately after removing the cookies from oven put the REESE'S peanut butter cups on top and then transfer the cookies to wire rack to cool. After the cookies are completely cooled, add four black lines to each of the sides of the candy to represent the spider's legs. Then use two small drops of frosting as glue for the eyes. Check out more great family-friendly recipes here, including one for a Crockpot Turkey that will help you save your time and sanity on Thanksgiving. What is your favorite Halloween inspired treat? These are cute and look like they are easy and fun to make! This would be a fun edible craft for kids to make on Halloween!! My kids certainly had a blast making (and eating) them! These look amazing! One of my favorite cookies! They are such a yummy classic with a fun seasonal twist! how fun! my toddler would love these!